I watched the following 14-minute video last night. I’ve seen several videos from the “Third Phase Of Moon” YouTube Channel in the past. I don’t think I’ve ever included any of them… simply because they didn’t provide the type of information I typically Track or they didn’t make a hard-enough case for the subject they were presenting. After doing last night’s research and Posting our information, I turned off the computer and was getting ready for bed when this video kept coming back into my mind. Something about it just wasn’t right. So I wanted to point out what “I” sense is a “manipulated” / “CGI” (Computer Generated Image) video. Remember, this is “my” opinion about this particular video. So you may want to watch the video first AND THEN come back here and ready my comments. I hesitated in stating my observations… because “IF” this really is a hoaxed video, my information will simply tell the creators of that video how to fix the next one. I’m pointing all of this out in order to show how easily most people, including myself, can be fooled… whether through the use of computer-generated graphics or psychology or both. For “me”, I really “want” and “need” this type of video to be real BUT, at the same Time, I do not want to be tricked into believing in false hope. 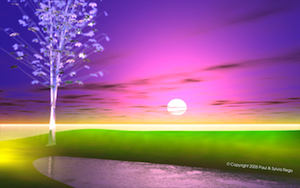 Many years ago, I used a handful of computer-based, 3D Modeling and Animation programs on my home computer, in order to see what this technology can do and to bring-out some of the images my imagination had created. So I’m only giving my “two-cents” on what “I” think “may” be happening in this video. First, the “video quality”… the Resolution of this video cannot be set higher than “360”. This means, “IF” it really was manipulated with a computer, there aren’t enough pixels in the video to allow us to see the insertion of the computer graphics. Second, it takes the Narrator over a full minute to show us the video. If this is such an important video, then why not show it right away? Instead, this video begins with the Narrator outside of a home, showing rain dropping onto binoculars. The Narrator then shows a clip from a video. That “UFO” video shows a path of asphalt broken-up and leading to an “object” that appears to be made out of chrome. It looks to be about 4-foot high and 4-foot wide. He is too quick, in my opinion, to point out that this is not “CGI” (Computer Graphics Image) and he explains why… He says it’s not CGI because you can see a girl walk in front of the “object” and that you can see the girl’s image in the reflection of the “object”. The Narrator is also too quick to steer us into thinking this happened in “Japan”. We see what I think is a “male” and another “female” in that “UFO clip” but, to “me”, the girl who walks in front of the “object” feels out of place. We never see her face but I feel that she’s not “Japanese”. The pattern on her shirt just feels wrong and it feels as though she’s part of the distraction… part of the possible “inserted image”, in order to get us to believe this “object” is real. There are only 3 people who are looking at this “object”. If it fell out of the sky, the military (in any country) would be all over this area. If the “object” is a piece of “Art” or anything else, more people would be gawking at it and kids would be climbing on it. The “important part” of this video is only shown up to the 5:47-mark. Before the video finishes, the Narrator goes back outside for the last 2-minutes and talks about “Star Fruit”. I don’t normally include something just because it contains some insights but this one wants Sylvia and I to share it. I’m including this because everyone has “potential”… a “gift”… a unique gift. Because we’re getting close to the dissolving of the “Veil”, Sylvia and I want everyone to begin remembering who they really are. “Never judge a book by its cover”. The potential… the “Stepping-Up” by another person, or even yourself, may not reveal itself until a certain situation is presented. This article (and video) is about a woman who Tweeted her Grandson to come over for Thanksgiving Dinner. The “mistake” was… she Tweeted a perfect stranger. After communicating back-and-forth a few times, they realized what had happened. However, the “stranger” asked if he could attend anyway. The GrandMother said: “Of course. That’s what GrandMas do. They feed everyone.” They’ve been good friends ever since. My comments: That’s the story “on the surface”. Remember, there ARE no accidents. I feel that those 2 families were supposed to connect during this part of their Timeline. Maybe it has something to do with their “Soul Contracts” with each other… Maybe they are from the same “Soul Group” and need to be connected to each other’s energies during the upcoming “Event” and since “Time” has run-out and the “Event” could be triggered at any moment, they couldn’t wait to “meet” on a more organic unfolding. So one of them “accidentally” contacted the other person. While cleaning our Supper dishes, Sylvia mentioned that the story (on that same website) that M.R. initially brought to my attention is also an example of “Soul Groups”… Souls finding each other where, logically, it would never happen. In this 1-hour video (every Tuesday), Lisa Harrison explains the energies of the planet from her perspective. Although I found a few bits and pieces which were interesting, nothing really jumped-out at me. However, I’m including this because some people reading this might want to hear what she has to say about “some” of the “Ascension Sickness” symptoms that some people have been experiencing. Especially feeling as if you’re “catching a Cold” but you don’t actually have a “Cold”. Lisa feels that each of us is purging negative energies and shifting old energies, in order to raise our vibration. While we’re doing this, we feel “sick”. Once this is complete, “some” people have felt those no-longer-needed energies move out of them and then they are filled with more beneficial energies. “Trump was right that Sen. Ted Cruz’s father was implicated with Lee Harvey Oswald. In this 1-hour, 23-minute video, Hypnotherapist Alba Weinman guides her Client through a Past Life and, later, talks directly to her Client’s Higher Self. Around the 53-minute mark, the Higher Self explains the transition to the “new Earth”. “…which will match the frequency of a new Reality.” It will come from the Sun. Last week, the day after Sylvia and I bought this new car, I found a tiny, confetti-like, purple, metallic “Heart” on Sylvia’s desk… right where the file-folder draw is… right where she knew I would be storing those new papers. I’ve been over her desk a few times, in these last 346-weeks, and know where everything is. There wasn’t a Heart there before. So I took this to be from My Sylvia and telling me she’s Guiding me and that I’m on the correct Path… the Path she wants us to be on. Our other car was a 1997 “burgundy, Honda Accord”. We bought it “used” from the local Honda Dealer. That car was purchased “by Sylvia”… “with Sylvia’s money” that she received from her family. So even though she kept telling me: “It’s OUR car”, it’s filled with Sylvia’s energy. Sylvia studied, on her own, “Dream Interpretation”. She always told me that “cars” / “your vehicle” represent your “Drive”. Both of those cars represent the “Drive” aspect… the “manifestation”… the “physicalness” of “My Sylvia”. Before Sylvia crossed-over… Before she was ever sick, she told me, many times, that she was “tired” and would like to just “go home”. So, her energies, like our previous car, were deteriorating. Once Sylvia placed herself on the other side of the “Veil”, she was “re-born” / “re-manifested” / “new and completely rejuvenated”. This “symbology” has now been sent to me, here as “Sylvia’s Drive restored”. I just now found that clip. It’s from “Episode IV: A New Hope”. It’s where Luke Skywalker is flying through the “equator” of the Cabal’s “Death Star” and has Darth Vader just seconds behind him. Near the end of that clip, I cried… and cried hard. This is partly because Sylvia and I always like to see “good” triumph over “evil” and, mostly, because we are all getting so very close to that “Veil” being removed. Be sure to visit the following web page, in order to read the entire Dream as well as his symbolic interpretation of what it means. A lot of this is based-on the information I’ve “read” or “heard”, online, is actually “true”. For all of this existence, my energies have, at least “partially”, been in-touch with “the other side of the Veil” / “positive unseen energies”. I still remember being “7” or “8” and being hit with a strong “Knowing” / “reassuring” that “I’m not from this planet” and being very excited about it. So, although I was married before Sylvia (for “1” or “2” years), I’m still a bit naive about certain aspects of the current Human “Society”. I avoid, as much as possible, lowering myself into the twisted, mind-games of the Cabal’s “ilLegal System”, “Financial Madness”, “half-truth Science”, etc. To me and Sylvia, the “details” of those Cabal ideas are traps which keep us from being in-touch with our true Path. They cloud our minds with skewed nonsense and keep us from tapping into our higher Senses and being able to decipher what is really happening within this “Reality”. When Sylvia crossed-over, my life ended. My mind went to mush. All of my senses were pulled-in close. My mental abilities and sensory fields collapsed. My focus on this “Reality” was brought in very close to this physical Unit (the “body” and its many Systems). My “Reasoning” and “short-term memory” is only now starting to get a bit better… just a bit. When I was “dropped into” our new-car situation last week I panicked and I’m still a bit stressed about what happened. So I do my best to remain tuned-in to My Sylvia as much as possible. I know she’s Guiding me because, without her help, I’d be “on the street” by now. Although we’ve had our new car for 1-week now, I’m “stressed” about it and still can’t understand why Sylvia placed us in this situation, but I’m not in panic-mode about it. Most people WOULD be. Maybe it’s more of my being naive about what happened… or it’s my “1-foot on the other side” sense… or it’s my true believing in My Sylvia that everything is fine… Yesterday was the 1st chance I had to look at our income and all of our monthly Bills, including the new car and it’s insurance. (Here’s the hyperventilating part…) Together, Sylvia and I bring-in $1,400 a month in total income. All of our Bills now total $1,323 a month… but this doesn’t cover FOOD or GAS for the car!!! Cut-back on expenses? We eat fried potatoes or pasta for Lunch and Supper and cereal for Breakfast. We only drive the car when we go to work. (95-percent or our errands are done “to” and “from” the days we go in to work. I wanted to start with what our current “Science” “supposedly” knows about “the linking of 2 or more objects”, in order to show that “some” of what I include in these Posts can be explained through “Society’s” current Science. This “Quantum Entanglement”… this unseen and misunderstood “Woman’s Intuition” is what me, Sylvia and a LOT of Beings on this planet (and throughout this Universe) are using to communicate with each other (at least in “pairs”), without sometimes knowing it. This is one reason why I keep saying that I need to remain connected to My Sylvia as much as possible. I know she’s continually “Guiding” me and “Broadcasting” various, sounds, images and feelings into me but if I’m stressed or distracted, I can’t read her very well. So I never think of Sylvia as being “somewhere I can’t imagine” or that she’s “too far away from me” because I not only sense that she’s right here with me but I can feel our connection to each other all the Time. Once in a while, I will sense that she’s not right here beside me. During those rare times, I simply focus more on her frequency and I receive a complete Knowing that we are still very much connected to each other. Whenever I think about the “Veil” collapsing, I see “watery-electrical” “wall”, with a subtle flash of light as it dissolves. I then see My Sylvia standing right in front of me, just on the other side of where that “wall” used to be. So I’m confident that the “Veil” will be removed in “my” lifetime and that Sylvia is always near me. Although this seems very trivial, the Point I want to make here is… “One” reason our home ALWAYS uses less electricity is because we do things “our” way. One of the ideas from “Society” is to never turn your Winter-heat “off”. Always keep your Thermostat “at” or a little “below” your normal setting. Even if you’re not home for the entire day… or even 2. This is because it takes much longer to heat your home up to the level you want it at than it does if you simply allow the Heater to continually pump warm air into your rooms. Sylvia and I never do this. We not only turn the Heater “off” when we’re not home, even for just a couple of hours, but we always turn it off while we sleep. (With that said, our Thermostat will not allow us to turn the Heater below 50-degrees. A similar thing happens at work… When several of us are working on the Loading Dock, if it’s cold, I’ll turn the Heat on. Not long after that, someone will open one of the other garage doors, bringing the cold, outside air into the building. On the other side of that issue, if one of them is inside the Trailer, where heat can build-up, they complain because they can’t breathe and simply can’t stand that much heat. I gladly switch places with them because Sylvia and I can withstand much hotter temperatures. So “why” is this happening? Have those people been “hot blooded” all their lives or is this a recent thing, which would tell me that they’re “waking-up” / “raising their vibrations” / “adjusting to the Ascension frequencies”? Only Time will tell. I can’t believe how fast “Time” is moving. These last few months have gone by much quicker than they should have. Right now, we’re standing at the beginning of the last week of November 2017. Remember, Sylvia and I are now simply waiting for the point in Time when the “Veil” is finally removed. So each day that has to move-aside, in order to get us to that last day, is a very good thing for us. So these quickly-moving weeks and months are good feedback that we’re just quickly discarding each “day” and “week” which don’t contain the removal of the “Veil”. I probably forgot several items which have been rolling through my mind lately. She states that the energies, which are raising our frequencies, are still changing. She says a “new” / “our original” Heart is now coming back online. As it does, we will continue to have physical adjustments and out-of-the-ordinary experiences. She relates 1 of her personal experiences where there were 2 of her — one “observing” and the other “experiencing”, as she walked through a UFO. When the video got to the 12-minute mark, I was fully paying attention. She said our “current” Heart is fading and our new “original” Heart is growing in strength and influence every day. She then said: “They will eventually integrate and become one. It’s getting easier and easier to get into that space. It feels like it won’t be long before we have a conscious choice to… be there”. Someone asks: “If this is a Matrix, why can’t we simply shut it off.” Lisa feels that we can’t because it would shatter our consciousness. Lots of good feedback from the Viewers, regarding what THEY are experiencing. She feels that “there is no gold because if they had it, they would have introduced gold-backed currency by now.” “They can’t use us as the Assets any more.” Lisa feels that “Block-Chain” currencies are a last attempt by the Cabal to hang-on to their control. In today’s Post by Cobra, there is only a title: “Battle For Antarctica” and 4 images. I’m not entirely sure what the 4th image is. Please visit the following web page, in order to view those images. My comment: So it seems that Cobra is telling us something, through those images. It’s interesting that Cobra chose the “Stargate” television series. Before Sylvia and I got rid of our television set, we used to watch some of the sci-fi shows. We like “Stargate”. We watched parts of “Stargate SG1” and, later enjoyed “Stargate Atlantis”. We found “Stargate Universe” interesting but not quite as good. A couple other Commenters are saying that “maybe” the “504”, in some of Cobra’s messages, is really “Antarctica”. Only Time will tell.